Luxury for your pampered pet. 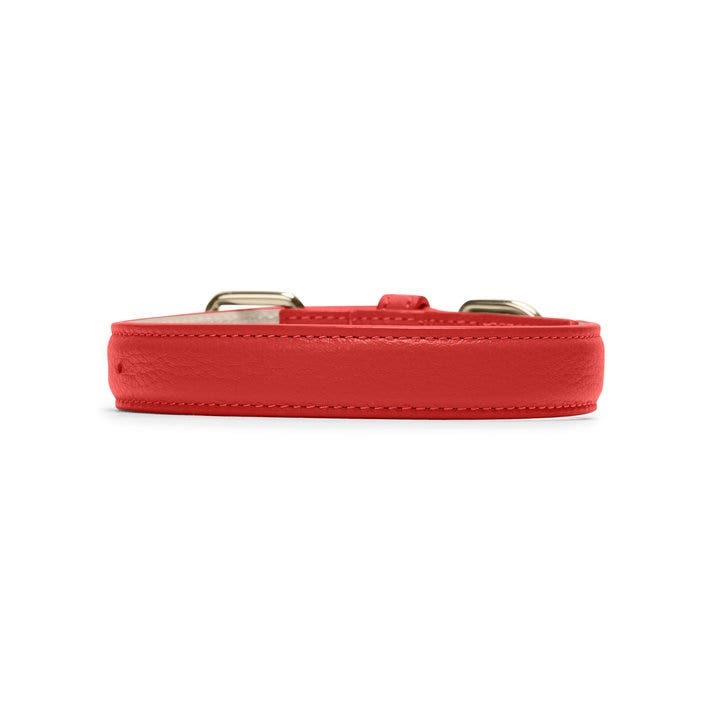 Our Small Dog Collar will add sophistication to your pet with its stitching detail and gold plated hardware. Made from our full grain leather and backed in our Italian Vachetta, a naked leather that naturally changes color and will develop a patina with time and use. If you want to go a step further and spoil your pet, add a monogram so that they are sure to grab the attention and envy of all their fellow canines. When measuring your dog's neck use either a soft measuring tape or a soft string and then measure the string. Add 1-2 inches to the neck circumference to allow for collar movement and comfort. There should be enough room to slide two fingers between your dog and the collar. Use this as your dog's neck size for purchasing a collar. good size and sturdy. Hope color stays true. Former purple collar faded. This collar is not for small dogs, despite some other reviews. I have a 10 lb. chihuahua mix, and he hated the collar. When I put it on him, he kept shaking his neck to get it off. It's way too thick and not very malleable. I regret buying this, since I had it monogrammed and now I'm out $50+, because the Leatherology customer service won't make an exception and accept a return on a collar that I absolutely cannot use. Never again will I order from here. I bought this collar for my 6lb male Yorkie. I have had a difficult time finding a quality, durable and appealing collar for him because most collars for his size are geared toward female dogs. The collar arrived very quickly and was packaged beautifully. It fits him perfefecly with no excess bulk choking him. It looks very lovely on him and has such a rich, classy fit, I couldn't ask for more! Plus his name is engraved on the collar as well so no chance for mixup at the groomer. Well done!